Do you have few extra pounds? Welcome to one of the biggest clubs in the world – the club of overweight people. According to some statistics more than half of the population in the world has at least a couple of extra pounds. This problem is especially present in the young generation in developed countries. Both men and women are equally prone to become overweight. The sad truth is that many people know about this problem, but they don’t do anything about it because “they don’t have time” or because “diets and exercise are boring”. If you belong to this category of people we have a very simple solution that can boost your loss weight plans – Muay Thai training in Thailand. Those who don’t follow the news in the field of tourism have probably never heard that more than 20 million tourists travel to Thailand each year. Of course, not all of them are looking for the same things from their holidays, but a significant number of them are interested in Muay Thai training. Muay Thai is a combat sport and fitness activity that has proven to be excellent for weight loss, but it also brings many other health benefits. In addition, to burning fat and calories at incredible rates, Muay Thai training can also improve the heart health, cardiovascular health in general and the health of muscles and bones. Students are able to sculpt their bodies in the way they want and improve their strength too. Muay Thai training in Thailand takes place in specially designed facilities called Muay Thai camps. Each camp has several professional trainers and most of them accept foreign students and both male and female students. These camps can be found in every major city or town in Thailand including popular tourist places like Koh Samui, Phuket Island, Chiang Mai etc. 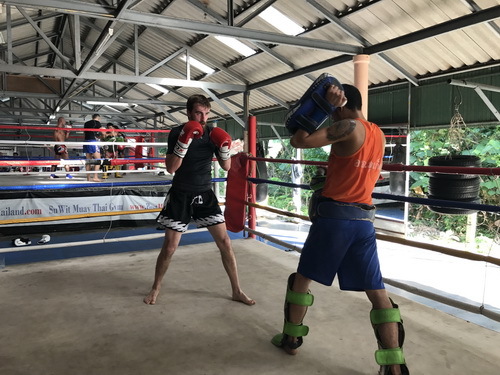 A Muay Thai training camp can offer various training programs suited to the needs of students and some of them have their own accommodation too. 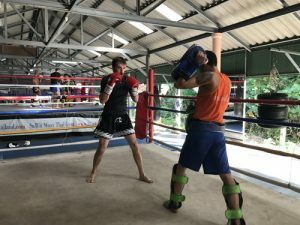 If you are still planning your holiday and you want to do something good for your health – join a Muay Thai camp in Thailand. Muay Thai can be defined as a sport designed with the aim of improving the level of fitness and toughness that is required for competing in a ring. Training sessions include many kinds of combat sport such as body weight resistance exercises, rope jumping, shadowboxing, running, medicine ball exercises, weight training, abdominal exercises, etc. Many camps in Thailand service training and room for tourist to lose weight and maintain good health with training. Muay Thai is a combat sport discipline which originated in Thailand. It utilizes striking in a stand-up position together with clinching techniques of various forms. This mental and physical sport that involves combat on shins is referred to as “the art of eight limbs”; this is because it features the use of elbows, shins, keens, fists, and a good physical readiness that increases the efficiency of a complete combat fighter. The training that is unique to a Thai fighter includes focus mitts, training with coaches on Thai Pads, heavy bag, and sparring. A typical daily training session includes many rounds of between 3 and 5 minute periods with intermittent short rest, about one to two minutes of these different practice methods. 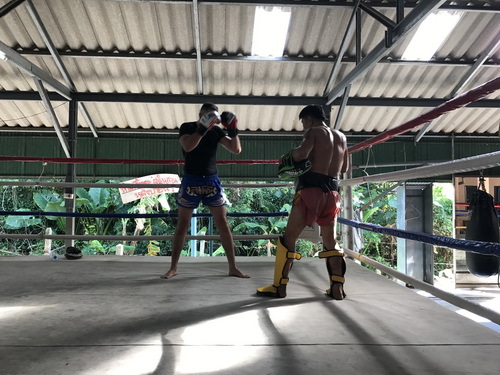 Thai Pad training is the hallmark of Muay Thai which includes practicing kicks, punches, elbows and knees hits with a trainer putting on thick pads to cover the hands and forearms. These unique pads (commonly called Thai pads) are used to receive the weight of the strikes from the fighter and enable the fighter to respond to the challenge of the pad holder in a real challenge. The trainer usually wears a belly pad around the abdominal area to enable the fighter attack with straight kicks to the body at any time. The most popular kicks in Muay Thai are known as the te chiang (upward kick) or roundhouse kick and the thip (“foot jab”). The te chiang uses a round movement of the whole body and has been largely emulated by fighters who are into other combat sports. This kick is performed when the leg behind is just a few distance back (about shoulder width) as opposed to upper- body combat (e.g. boxing) whereby the legs must maintain a larger base. A round-house kick is made powerful largely by the rounded movement of the hips. Counter rotation of the arms and shoulders are also often used to add torque to the lower body and increase the power of the kick as well. The elbow can be used as a weapon in many ways: uppercut, horizontal, diagonal-upwards, downward, diagonal-downwards, flying, and backward-spinning. It can be used as a finishing move. It can also be used to cut the opponent’s eyebrow so that his vision might be covered by the flow of blood. The diagonal elbows are quicker than the other types but are not so severe. The elbow strike is believed to be the most fatal form of attack in Muay Thai.